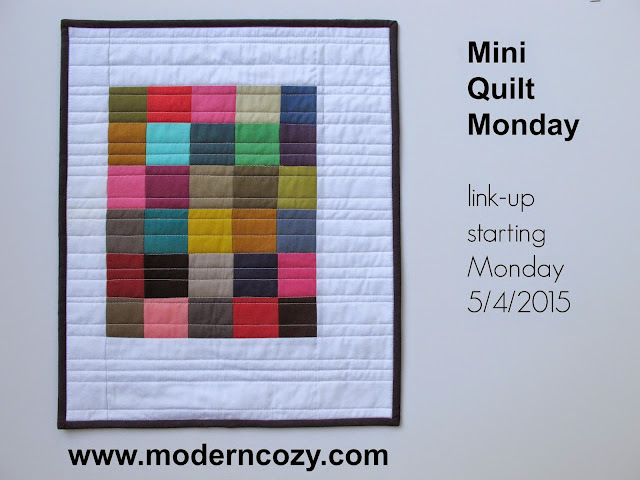 My friend Darcy/Modern Cozy is starting a Mini Quilt Monday link-up next week! I do love a mini, so I'll definitely be participating as I can. Darcy is kind of a master at minis - and I'm pleased as can be to have one of hers hanging in my studio. Check out some of her minis here. Sew Mama Sew's Giveaway Day is May 6! This bi-annual event is always great fun and I'm mulling over what to give away this round. Plus there's more options than ever - you can post on your blog, facebook page, or Instagram. Watch for hashtag #SMSgiveawayday, and check in here and at Sew Mama Sew next week to see all the giveaways! Next is the Blogger's Quilt Festival hosted by Amy's Creative Side. Another bi-annual event, it's a wonderful way to show off one or two of your quilts as well as see oodles from your fellow makers. There's 11 different categories and you shouldn't miss joining in. So how are YOU joining in? I was too late to get in on the giveaway of this little cutie, but what the heck. I have wanted to make a doll quilt for my granddaughter anyway, and give her the one I got from my grandmother 70 years ago. She's the only granddaughter I'll ever have, so it's time. The boys will get other things.